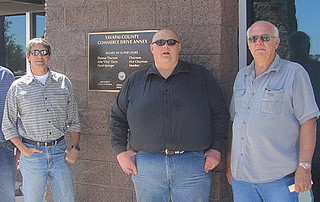 The new 24,000 square foot Yavapai County Administration Building celebrated its grand opening on Sept. 19th. On hand for the festivities were County Supervisors Carol Springer and Chip Davis. Supervisor Tom Thurman was unable to attend. Designed by Prescott based Catalyst Architecture, the building is a model of energy and resource efficient design. During their opening remarks, both Supervisors Springer and Davis proudly listed the sustainable aspects of this state-of-the-art administration facility which included, natural daylight, water harvesting, an innovative stratified heat recovery system, and the energy efficient raised-floor delivery of the buildings heating and cooling systems. The building's raised floor system allows mechanical, electrical, data, and phone conduits to run freely below the finished flooring, providing ongoing flexibility and adaptability for changing technologies. The building's steel super structure is completed by an exterior, load-bearing masonry perimeter and Structural-Insulated-Panel (SIPS) roof envelope, increasing the facility's energy-efficiency and reducing maintenance costs. A sound-masking system creates a comfortable working environment for the open offices. With sustainability, energy-efficiency, and reduced maintenance and operation costs as the guiding goals for the project, Catalyst led the design and client stakeholder team through the firm's unique two-step "Value Optimization" process. "We take cost very seriously" explained Ackerman. Value Optimization turns traditional value engineering on its head, by pairing up the project team's design and engineering-side specialists, with construction side sub-contractors from the same trades early on in the design process, in order to brainstorm the most cost-effective ways to deliver the clients preferences for the building envelope as well as all of its major building systems. 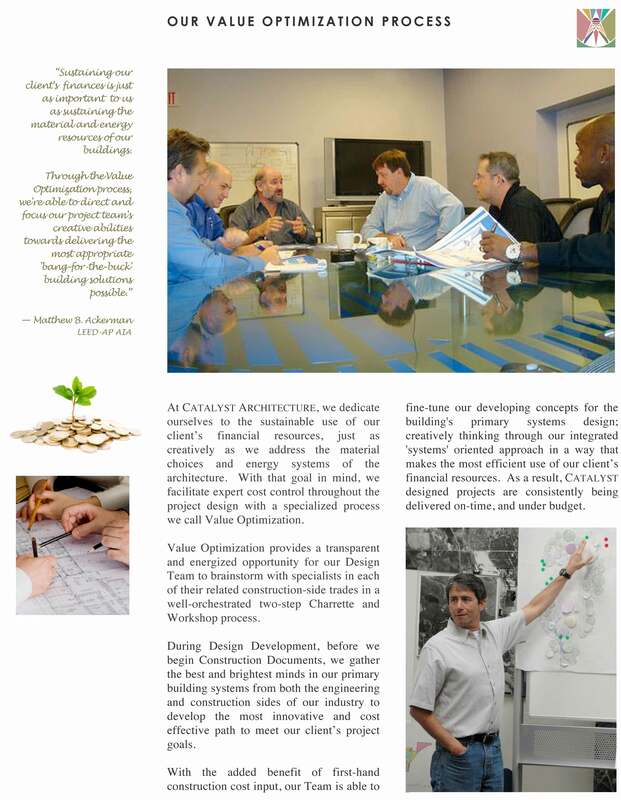 By gaining valuable insight into constructability and maximizing the integration of mechanical, electrical, and structural systems, the Catalyst design team was able to consistently eliminate redundancies and improve efficiencies throughout the building's design. "We consider our client's financial resources to be as important to 'sustain' as the material and energy resources that go into our buildings", explained Ackerman. This creative and collaborative focus on cost control throughout the early stages of the process, resulted in all 16 bids coming in under the County's stated $5M budget- a noteworthy achievement for the architect and for the County. According to building's contractor Travis Knoll of Straightline Construction, the final construction cost was just under $4.5M.